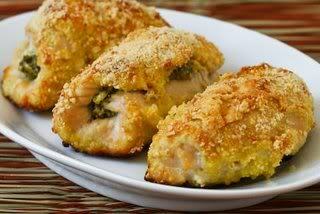 A very simple baked chicken breast recipe for those of you who like a bit of style. It only take 30 minutes from start to finish so also pretty good if your limited on time. Serves 4. First of all you need to remove the skin from the chicken along with any fatty bits. It is also better to debone the breasts although this is not essential. Cover the chicken in a light coating of mustard. Add salt and pepper. Mix the herbs and the fresh breadcrumbs together and then spread over the chicken. Ensure that the chicken has a good coating all over and then pour on some melted butter. Put the chicken into a preheated oven at 170 C and cook for about 25 minutes. They should go lovely and brown. Thats it, it's that simple and it is seriously tasty, in fact I might go and make some now! Tip: You can use this baked Chicken recipe with wings and legs aswell.